A man in China looking through old photographs has discovered he was in the background of a picture taken of his wife nearly twenty years ago. 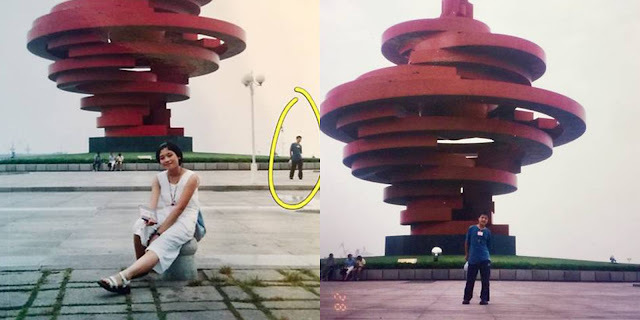 It seems both Mr. Ye, and his future wife, Ms. Xue, were visiting May Fourth Square in the city of Qingdao at the same time on July 28, 2000. Below, they can be seen in front of the famous “May Wind” sculpture, built to commemorate the May Fourth Movement in China. Mr. Ye can clearly be seen posing in the background of his Ms. Xue’s photo. The two would not meet for another eleven years. Mr. Ye said he was searching through his wife’s old photos to see who their twin daughters resembled more when he spotted himself hanging out in the background of her picture. In another surprising coincidence, both Mr. Ye and Ms. Xue were at the park that day because of their mothers. Ms. Xue’s mother wanted to visit the city of Qingdao while she was recovering from surgery, while Mr. Ye’s mother had recently suffered from appendicitis—and he was taking her place as part of a group tour. The story went viral after Mr. Ye shared his find on Chinese social media.